The ancient Roman city of Pompeii in Italy lay hidden and forgotten under the volcanic waste for over 1500 years before archaeological excavations slowly began revealing the lost city. On the ill-fated day of August 24, 79 AD, Mt. Vesuvius erupted so cataclysmically that the huge volcano literally blew its top (see capless Mt. Vesuvius in photo's background). The explosions sent a billowing column of volcanic steam, cinders and ash high into the sky. Soon the heavy aerial debris showered on and buried the once thriving Roman city of Pompeii. Most of the 20,000 citizens escaped with their lives. However, about 2,000 lingered too long in gathering their valuables and died on the spot, likely by toxic volcanic fumes. Pompeii quickly changed from metropolis to necropolis. The Roman scholar Pliny the Elder witnessed the disaster and wrote: "The thick black cloud advanced behind us like a flood. We could hear women shrieking, children crying and men shouting. Many people begged for the help of the gods, but even more imagined that there were no gods left and that the last eternal night had fallen on the world. 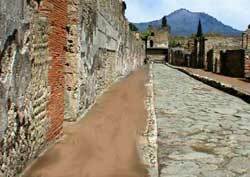 Most of Pompeii's streets and buildings (including temples, theatres, shops, homes and public baths) have been uncovered. So have wall murals and floor mosaics depicting everyday life. Tourists and anthropologists now have a sharper idea of what daily Roman life was like.